Glyn Jones served on HMS Gambia's 1958/60 commission as an Ordinary Seaman. He was a keen sportsman and was named "Sportsman of the Month" on page 24 of the January 1969, Issue 175 of Navy News. Playing for the Royal Navy only one week after he had played for United Services (Portsmouth) shows how apparent was the natural aptitude for rugby football possessed by PO (PTI) Glyn Jones, the U.S. and Navy fly-half. Glyn Jones. now serving in HMS Daedalus. was born at Pwllheli (Carnarvon) on November 22. 1941, and Joined HMS Raleigh as a junior seaman in February, 1958. Association football was his first love - love which he still has and a game in which he takes part whenever the opportunity occurs. In H.M.S. Dryad. while he was qualifying as an RP rating. he played soccer. and when he joined his first ship, the cruiser HMS Gambia. he says he played "just about everything except rugger." It was in the Gambia that he played for the Home Fleet at soccer. going on to play cricket for the Navy in Singapore. 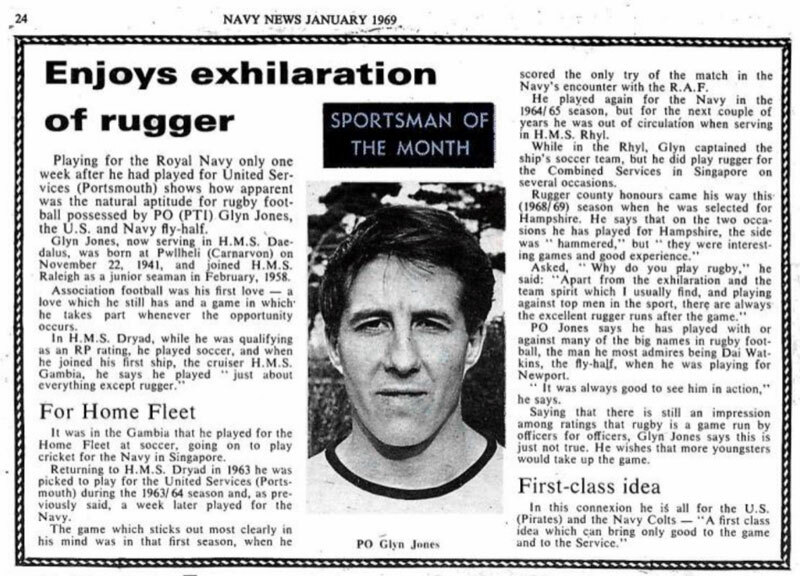 Returning to HMS Dryad in 1963 he was picked to play for the United Services (Portsmouth) during the 1963/64 season and, as previously said, a week later played for the Navy. The game which sticks out most clearly in his mind was in that first season, when he scored the only try of the match in the Navy's encounter With the RAF. He played again for the Navy in the 1964/65 season, but for the next couple of years he was out of circulation when serving in HMS Rhyl. While in the Rhyl, Glyn captained the ship's soccer team, but he did play rugger for the Combined Services in Singapore on several occasions. Rugger county honours came his way this (1968/69) season when he was selected for Hampshire. He says that on the two occasions he has played for Hampshire. the side was "hammered," but "they were interesting games and good experience." Asked, "Why do you play rugby." he said: "Apart from the exhilaration and the team spirit which I usually find. and playing against top men in the sport, there are always the excellent rugger runs after the game." PO Jones says he has played with or against many of the big names in rugby football. the man he most admires being Dai Watkins, the fly-half. when he was playing for Newport. "It was always good to see him in action," he says. Saying that there is still an impression among ratings that rugby is a game run by officers for officers, Glyn Jones says this is just not true. He wishes that more youngsters would take up the game. In this connexion [sic] he is all for the U.S. (Pirates) and the Navy Colts — "A first class Idea which can bring only good to the game and to the Service."